Home > Ekanoo > Ekanoo Racing > News > Daniel Pharris to Debut ex Ekanoo Lexus RC-F in Limited Drag Radial at OSCR V! 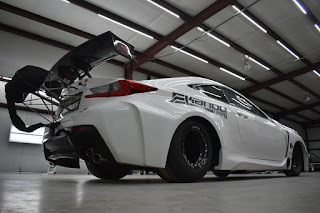 Daniel Pharris to Debut ex Ekanoo Lexus RC-F in Limited Drag Radial at OSCR V! While the rumors have been floating around for two months since the deal was finalized, the goal for the Pharris Motorsports team was to debut the ex-EKanoo Racing Lexus RC-F drag radial car at none other than the Holley EFI Outlaw Street Car Reunion V on April 18-22nd at Beech Bend Raceway Park. Well, the team at RK Racecraft has made that rumor official with the final jobs completed and the car ready for pick-up after Colyn Crighton and his team at Glasslife Atlanta put the final touches on the new endeavor for the team for the 2018 season and beyond. For those who do not know, this car features a Pro Line Racing built 481X powerplant with a set of LDR class legal 88mm twin turbochargers from Precision Turbo & Engine, both top marketing partners with the OSCR. While we’re not going to bore you with a host of details, we are extremely proud and excited to have Daniel Pharris debut this extremely nice and one-of-a-kind hot rod at the Outlaw Street Car Reunion next weekend, April 18-22nd. All of the world will be tuned in and watching as the famous EKanoo Racing RC-F makes it’s debut on American soil, one of the first cars in the history of drag racing to be built outside of the US, to be purchased and raced in America. Early in much While the beast was still racing with Ekanoo shortly before they sold it,Khalid Mohammed put his safety gear, seat belts and HANS Device on, just as if it was any other pass. Team Principal Ebrahim Kanoo stood alongside his masterpiece Lexus RC-F Pro Mod, just as if it was any other pass. In 5.379-seconds, it was abundantly clear this planned test lap down the 1,320-feet of concrete at the Bahrain International Circuit (BIC) was more significant than almost any other. But as the test session came to a close, the team came to the conclusion that their impressive eighth-mile marks were more than enough to see the well-known doorslammer dip into the 5.3-second zone over the quarter-mile, and likely encroach 280 miles per hour. So, why not let their skilled wheelman Khalid Mohammed leg it out the backdoor?